Makyla Green eagerly files out of her classroom at the Southern Illinois University Edwardsville East St. Louis Center (ESLC). The SIUE Upward Bound student is participating in the place-based environmental research project led by SIUE’s Danielle N. Lee, PhD. Lee is a visiting assistant professor in the College of Arts and Sciences’ Department of Biological Sciences, who has been internationally recognized by the National Geographic Society as an Emerging Explorer. The project is one of six at the ESLC that is funded by CAS’ Targeted Funding Initiative (TFI). Also working with the students was Ben Greenfield, PhD, assistant professor in the Department of Biological Sciences. Students observed and recorded plants and animals by taking photographs, making sketches and collecting plant samples. They were divided into a mapping team, a plant and tree identification team and an animal and insect identification team. “The class has reinforced the science skills they are learning at their schools and in their Upward Bound classes,” Lee added. Students will give the presentation on the results of their research efforts and have a panel discussion, facilitated by ESLC Executive Director Jesse Dixon at 4 p.m. Friday, June 2 at the SIUE East St. Louis Center Resource Center, Building B, 601 James R. Thompson Blvd. Also participating in the panel discussion will be Lee and Greenfield. 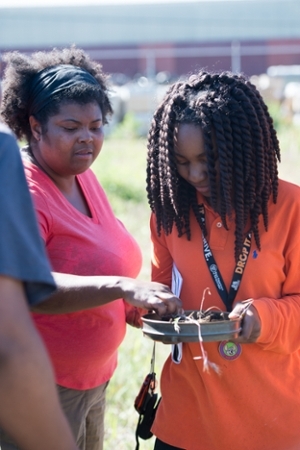 Dr. Danielle Lee, a visiting assistant professor in the College of Arts and Sciences’ Department of Biological Sciences (left) and Makyla Green, SIUE Upward Bound student, survey a frog that students discovered during an environmental research project, funded by CAS’ Targeted Funding Initiative. 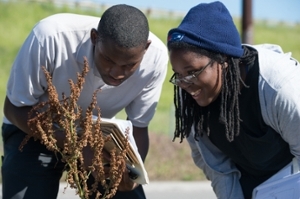 SIUE Upward Bound students Egar Williams (left) and Eve Hill discuss identifying one of the plants along a nearby city street from the SIUE East St. Louis Center.